This question begins the video above, which introduced the new project Poets & Saints from worship duo All Sons & Daughters (Leslie Jordan and David Leonard). This is the perfect question to start with because, in many ways, it encapsulates the entire project. Many of the names that inspired these songs will be familiar, as will some of the lyrics taken from famous writings or traditional prayers and liturgies. But even when the songs are wholly new, they feel old — in a good, grounded way. All worship is done in response to who God is and what God has done for us. The Scriptures tell us that we love because God first loved us. Our ability to understand and live into these truths is enhanced when we hold together with our personal experience the rich tradition of the Church. And that’s where this album gets it right. Much of the contemporary worship music written and released today focuses in on the emotions and experiences of the singer. Even when a song quotes Scripture or a line from a hymn, it often feels in service to what the modern-day songwriter has composed. Either it justifies or illustrates what we are going through. Poets & Saints feels like it does the opposite — our lives and experiences today are illustrative of the truth found in the writings of those that came before. In their study of the individuals that inspired the album, they found ranges of emotions and experiences — from love and joy to pain and sorrow. This is most evident at the heart of the album, the middle two songs. “This My Inheritance” draws from 1 Peter 1 to proclaim that nothing can take away the inheritance that is ours in Christ. By including a traditional doxology as the bridge of the song, it reminds us that this inheritance extends through Church history to us as well. “You Are Love and Love Alone” is inspired by Saint Thérèse and adapts a hymn from Frederic William Farar. Thérèse had many struggles throughout her short life, but she stayed focused on reflecting God’s love to those around her. She once wrote, “to love: how perfectly our hearts are made for this!” This captured Leslie, giving words to a feeling she says we all have deep down. As I think about this album, I keep coming back to that opening question, “We’re not the first people to sing that song, are we?” This album masterfully combines lyrics written by poets and saints with original lyrics as well. So we are both literally not the first to sing some of them, but even the new songs feel familiar. And by familiar, I don’t mean: Oh, this one is like “All the Poor and Powerless.” Leslie and David continue to evolve and develop their sound, even as they rely on acoustic guitar, piano, and their incredible harmonies. Rather, these songs are familiar in that they are instantly singable. Almost every song has a section that people can pick up quickly and will stick with them. A few songs are a bit high, especially for men, but there are plenty of songs you can incorporate into your worship rotation. 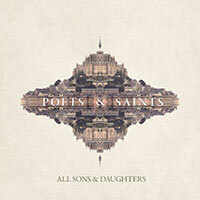 As a pastor who has both planned worship and lead worship bands, I have long loved All Sons & Daughters. Their music is theologically and artistically rich. This album, their fourth full-length project, is their best yet. In fact, I have a great hope that this fusion of modern music with a traditional foundation will build similar connections in the churches that sing these songs. Should you wish to use some of these songs at your ministry, you can find chords to their songs on the resources page of their website. They have also released a tutorial video for the first single “I Surrender.” As you hear in my interview with Leslie on the Art of the Sermon podcast, they have a huge heart for the local church, and they are great about making resources available to help you. The album is also part of a larger project. There is a companion book and curriculum from the duo’s pastor Jamie George, as well as a full pack that churches can purchase that includes the book, album, and a DVD of footage from various locations tied to the individuals covered in the book. I have not reviewed the curriculum, but the book is engaging and very easy to read. When you check out the album, I would love to hear what you think! Share in the comments below your thoughts on the music. Also, let us know if you try out any of the songs at your ministry and how it went!